IC Python API:Animating A Character - Reallusion Wiki! Main article: iClone Python API. 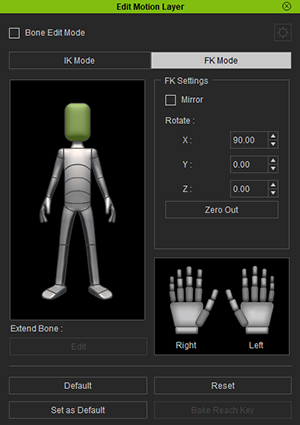 This page will cover iClone's Character Animation System and ways to control it. In iClone, all character actions are driven by Motion Bones which have fixed structure and names that can't be changed. 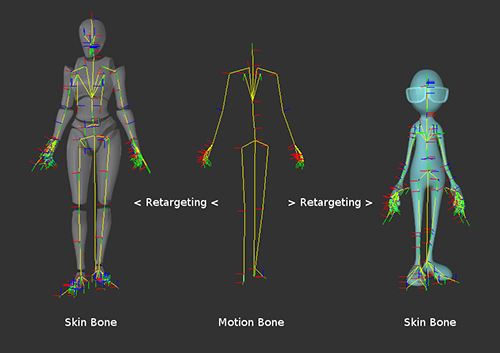 Motion Bones are where all the motion data are stored - if you are familiar with MotionBuilder, you can think of it as the "Source Character". So any motion applied to the Character, are in fact, applied to the Motion Bones then retargeted onto the Characters' Skin Bones in real-time. Therefore, there are two separate functions for retrieving each bone type as illustrated in the sample code below. Before running the script below, be sure to have a Character loaded in your iClone scene. If you want to animate a character, make sure to apply a Motion Clip in order for us to add keys. Run the script above and you should see the character is looking down. Open Edit Motion Layer, click on FK Mode and pick on the Head bone - you'll notice that the value for X is 90.